We earn money to spend. We all spend on basic necessities including food, clothing and shelter. And we spend money on justifiable stuff including entertainment and some comfort. If you have kids, there are inevitable expenses on education too. Understandably, these expenses are unavoidable. But what about that large amount of money we spend on useless stuff? I mean, stuff that we do not really need or just cannot use for any reason? Surely, you will find lots of such useless stuff lying around the house. This brings us to the question, why we spend money on useless stuff. There are several answers. Possibly, one of them may help identify why you spend money on useless stuff. If you believe only rich people buy useless stuff, think again. Millions of people worldwide with little money also spend on things they never use or have little purpose. Here are some reasons why we spend precious money on buying unwanted things. Anxiety and depression are one of the main reasons why millions of people across the globe suffer from something called Compulsive Buying. Psychiatric research conclusively prove, people suffering from Major Depressive Episodes (MDE) and Generalized Anxiety Disorder (GAD) are prone to buying useless things. A strong link also exists between substance abuse- alcohol, narcotic drugs, psychotropic substances or even food and Compulsive Buying, say psychiatric studies. The reason: Shopping imparts instant gratification. It tends to raise a person’s mood. And they are willing to do anything, including splurging money they can ill afford, for this sense of well-being. If you suffer from Compulsive Buying, it is best to consult a psychiatrist. Seeking professional help may cost. Yet, it can help prevent your financial ruin. A lot of us buy useless stuff to impress people. This is sheer waste of precious money. Instead of splurging on items we do not require, the money can be well utilized by investing in savings or retirement plans. Unfortunately, it is poorer people that suffer from this type of spending on useless stuff. It makes them feel they too can afford stuff that wealthier people have. Such type of competition and buying stuff to impress others is singularly useless. There are no guarantees you will find acceptance among the wealthier crowd. Also, you may end up as laughing stock among peers and others for spending on useless stuff. A lot of such stuff needs maintenance too. Remember, buying is a one-off expense but maintaining something, including an expensive dress, is a recurring cost that eats into your finances. Instead of buying stuff to impress people, invest your money in excellent savings schemes and plans. Such investments will impress others more because they see you are making the money work and grow. Credit cards rank among the biggest culprits. They make us spend money on useless stuff. The reason is very simple. When you spend on credit card, the pain of paying cash is clearly absent. Also, you have that comfort of paying later or in installments. While credit cards are excellent if we use them prudently, they can be a bane for those given to impulsive buying. Usually, people with credit cards tend to buy more during sales and discount offers or try newer, expensive stuff they really do not need. The result: such stuff usually ends up being scarcely used. Perishables expire and have to be thrown away. Regardless what you do with the stuff, a credit card issuer will always claim the money. Failure to pay on time attracts Average Purchase Rate (APR) or a type of interest that can run as high as 32 percent of your bill, when it accumulates. Thus, you are not only spending money on useless stuff, you also pay a price for the folly. Think twice before using a credit card. In fact, think thrice if you have genuine need for a credit card. Consider all the bills that will land on your doorstep. Try calculate the APR you would end up paying when you buy useless stuff. Ever watched the Hollywood movie ‘Confessions of a Shopaholic’? It is all about a psychiatric problem called shopping disorder. This is a type of addiction and has severe, negative impact on your mental, physical and financial wellbeing. Understandably, we live in a very consumerist society where commercials and ads of all sort compel us to try and buy something. However, shopping disorder exists since centuries and is nothing new. If you suffer from shopping disorder, chances are, you will spend money on useless stuff. And lots of it too. Shopaholics or victims or shopping disorders, plan their binges. They are constantly making plans about when, where, what and how to shop. To fulfill this urge, you might end up borrowing money from relatives and friends or taking salary advances. A shopaholic stops at nothing. They continue buying useless stuff, even when they have little money. They also create sob stories to make people lend money to satisfy this shopping addiction. Shopaholics also experience withdrawal symptoms like alcoholics and drug addicts. A shopaholic will usually become very irritable, disoriented and depressed unless they shop. Shopping addiction is a behavioral disorder. If you spend money on useless stuff due to shopping addiction, there is nothing much to worry about: this disorder can be treated and arrested with professional help. Should you be a shopaholic, suffering from shopping disorder, seek professional help. It is a treatable addiction. Support forums for shopping addicts are available worldwide. Your psychiatric counselor can guide you to one such support group nearby. Impulsive buying is not the same as shopping disorder or buying due to anxiety and depression. Instead, impulsive buying is a term used to describe sudden, unplanned purchases. This happens because you saw something attractive at a store and suddenly felt an impulse you need it. You will not have made plans to buy the stuff or know whether it would be genuinely useful. Impulsive buying is very common to all of us. We do it several times a year. It is not a behavioral or psychiatric disorder. Hence, you need not panic. In fact, most impulsive buying occurs when we have sufficient cash or enough balance on credit card. Yet, impulsive buying ranks among biggest culprits for why we spend money on useless stuff. A lot if impulsive buying occurs among casual window shoppers. You are also at some risk if you are a person that easily gets carried away by claims made on advertisements. Exposure to such stuff creates an artificial need in our brains. We end up with the fake belief that a particular product will make life easier. It is very easy to prevent impulsive buying. Instead of getting swayed by commercials or window displays, pause for some time. Ask yourself whether you really require the stuff and how it would help you. Also, defer the decision to buy. Promise yourself to return to the store and buy the stuff. This way, you do not spend money on useless stuff. Panic buying is another major reason why we spend money on useless stuff. Panic buying occurs when we fear there would be shortage of something or a price rise is imminent. We rush to stock our homes with stuff to ensure we have adequate supplies or to save money. In any case, panic buying is one of the reasons why we waste money on buying useless stuff. Interestingly, panic buying is not a phenomenon that affects poorer countries or people, residents of disaster and war zones. It is also prevalent in developed and developing economies. Food and fuel are two items that are usually hoarded by panic shoppers. Such panic buying is usually futile. Because foodstuff tends to expire or spoil unless stored with extreme care. And storing fuel can prove very hazardous due to its highly inflammable nature. Hoarding deprives others who need the stuff. Also, your money remains blocked. Eventually, the price rise or scarcity you fear may never materialize. You need not spend on useless stuff due to panic buying. Food and fuel scarcities are quite uncommon nowadays. Prices may increase but paying a little more to get fresh stuff is better than allowing the food you hoard to spoil or rot. Why we spend money on useless stuff? Another answer is to be found in those frequent sales and special offers made by online as well as brick-and-mortar retailers. These retailers hold sales to get instant cash while disposing older stuff. Special offers attract you to buy. Remember, the retailer loses nothing by making special offers or holding sales. You lose money because of buying useless stuff only because you believe it is cheap. Often, something sold at hefty discounts comes with a catch. Special offers are also made to dispose of things that do not commonly sell. But our thinking hoodwinks us into believing we are getting a great bargain for something. And usually, that stuff is something we do not require. You may have noticed the amount of money that online as well as brick-and-mortar stores spend on advertising their sales and special offers. Ever wondered from where this huge advertising budget comes from? It comes from profits made by selling useless stuff to unsuspecting customers like you and I. The next time you see a sale or special offer, find whether you really need that stuff. Also, find reasons behind why something is on sale or special offer. The answers will amaze you. Stop getting tempted by these offers, if you do not wish to spend on useless stuff. You may never have heard this term Emotional Spending. It affects millions of ordinary and perfectly healthy people worldwide. Why? Our emotions drive us to shop and spend money on useless stuff. Some such emotions include guilt, shame, anger, pain, hunger, loneliness, tiredness, jealousy, euphoria and fear. Why? Because a lot of us are unable to cope with these emotions. They overwhelm us to an extent that we desperately look for relief or outlet. Shopping provides relatively safe relief or outlet for these emotions. The joy of shopping helps overcome these insidious thoughts and feelings. Undoubtedly, we are humans who will undergo various emotional ups and downs. Shopping to overcome these emotions is not altogether wrong. Unfortunately, we spend on useless stuff when we engage in emotional shopping. Such shopping is more driven by emotions rather than necessary or rationale. Emotions arise out of thoughts. Thoughts arise from our five senses- sight, sound, smell, sensation and taste. Identify your emotions and thoughts causing them. It is fairly easy to do if you are willing to take some effort. This can help stop you from spending on useless stuff. This adage would apply to a lot of people who spend on useless stuff. Remember, the money you spend on useless stuff can find better uses elsewhere. As I suggest, make this money work for you through savings and investment plans. Even if you can afford, keeping useless stuff proves cumbersome. Normally, useless stuff ends up in three ways: rots somewhere at home or workplace, sells for a much lower price or ends up in trashcan. At best, you may donate it to some charity where it may find some use. Despite, you would still have to spend money on carrying it to their premises. In any case, the above reasons why we spend money on useless stuff will help you cut shopping costs and save for better future. 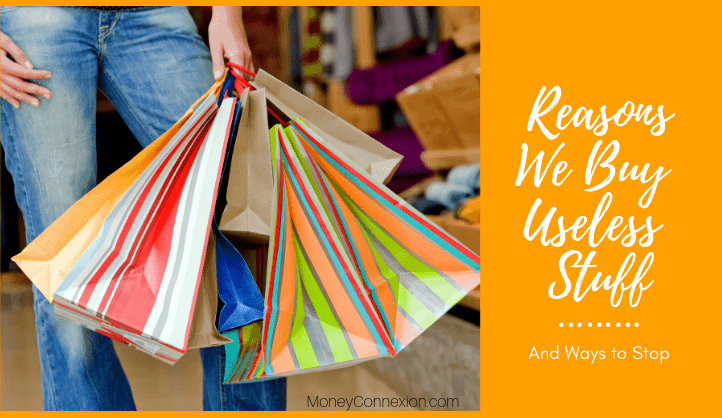 These ways to stop spending on useless stuff are time tested and proven worldwide. Use them if you are prone to spend on useless stuff. I’m looking here need for my future plane to get altot money. Thanks to the AUTHOR it’s very informative and important guide to everyone. I strongly agree with this point that we should not spend money on useless things such as impulsive buying, and panic buying. Thank you for your outstanding information or tips on the money. Good. adia for saving money. Money connexion has everything about money for its members. to start going . i,m really anxioius to do something but lack internet knowledge. how can i start something that could inhance my monthly pension. Good research on purchases. article that most women suffer. Amazing stuff! Thanks for sharing with us! The above article clearly identify the philosophy that people spend time in school to study finance But at the same time they can’t manage. Online methods of making money from home or through the internet are mostly lies and trickery to get us to spend our money. For example, if I should tell you about a great way that I am making money, while also showing you the things I have bought with it, ie., fine new homes, boats, airplanes, cars and awesome vacations you are going to want to have those things too. Now all I need to do is add a promise of getting information to you so that you can copy my success. However, the information I give you is costly and may be incomplete or a complete scam. There are many of these lies. The ones that work best are the rags to riches stories that promise great wealth almost overnight. It’s all B.S. Thanks Sir for such a great knowledge on money. Really I will remember before spending unnecessarily.